Observation - Tenthredo notha Portbury Wharf - UK and Ireland. Description: Seen feeding on composite on the bank of a rhine (local terminology for drainage ditch). Thought it was a wasp. Later realised it was a sawfly. Seen feeding on composite on the bank of a rhine (local terminology for drainage ditch). Thought it was a wasp. 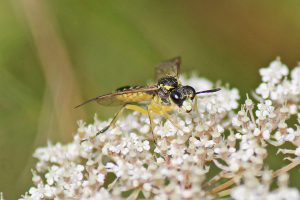 Later realised it was a sawfly.